H.F. Wilson established itself as a custom and contract manufacturing facility 40 years ago and continues to be recognized today as a great manufacturing facility as part of our tradition. Over the years we have developed many innovative products for our own operations as well as customers and suppliers to help solve a problem arising due to supply chain issues, manufacture discontinued, price increase affecting cost of procurement, new designs, etc. At our modern manufacturing facility, experienced and dedicated personnel are available to support you in any way possible to help provide a solution. The organization’s focus at our manufacturing facility is to manufacture and design QUALITY products that are competitive in the global market. The standard within our manufacturing facility ensures excellence in process controls, wide range of most up-to-date equipment, and continuous training to our employees at every step of our operations. Our success depends on your evaluation of our services and products from our manufacturing facility. The organization is rated internally and externally on Customer Satisfaction ratings to ensure that focus is based on long term repeat business and customer growth. Global competition pushes suppliers and customers to be very aggressive in finding alternatives for low cost solutions with highest levels of quality. Our objective is to help provide you the necessary ADVANTAGE in the marketplace with our proven manufacturing facility equipment and staff. 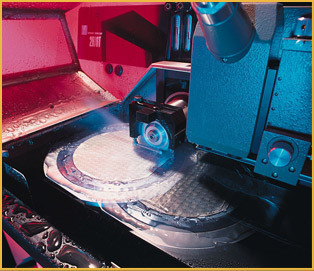 H.F. Wilson has the ability to produce all types of tooling and dies in our manufacturing facility. The experienced staff has equipment to design and produce tooling for manufacturing of the highest quality. Our CNC machining center helps to eliminate material handling and human error while assuring a high degree of part repeatability, accuracy and time savings. Upon request for high volumes in manufacturing our offshore partner manufacturing facility can help achieve the production in a low cost effective manner. Our responsibility involves the COMPLETE MAINTENANCE OF ALL DIES AND TOOLING. The service includes prototyping capabilities, CAD/CAM department optimizes die and part production at the planning stage. With our ability to incorporate prototype tooling into the production dies, we can further lower costs particularly on the lower volume applications.